Industrial Stackable Bins for Warehouses | Ace Industrial Equipment, Inc. Ace Shelf has extra large, heavy-duty polyethylene stackable bins that have up to 100 lbs. stack capacity per bin. With ultra thick walls and reinforced ribs for strength and stability, stackable bins from Ace Shelf are intended for years of use. We have both new and used stackable bins to fit any budget, and all used bins are inspected to be free from splits, cracks and other defects. Designed for multiple uses, these stackable storage bins can be stacked up to six high to create a sturdy, tall and complete storage system. 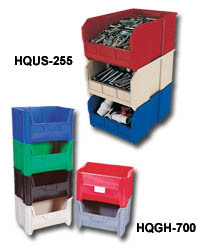 Stackable bins are available in gray, blue, ivory, black and red. Call Ace Shelf today for availability of new and used stackable bins for your warehouse. For more information on the different types of stackable bins and shelves and other warehouse bin equipment we offer call 1-800-300-6034.